In this interview I speak with Gary Thuerk. Don’t know who Gary is? He’s he guy that send the very first “Spam” email message. An “unsolicited Commercial Email Message”, back in 1978! Gary while working with DEC Computer sent the very first Spam to 400 of the government contractors then associated with APRANet, the very beginning of the Internet and eMail. Listen to Gary talk about how the Cold War drove the Internet, how sending out his one email shut down the servers at the University of Utah, and how to this day, Gary gets “hate mail” for creating Spam. LS: Hello, my name is Lon Safko the author of The Social Media Bible published by John Wiley & Sons, the most comprehensive book every written on the subject of social media. I am really excited about today. We’re here with Gary Thurek, the Father of Internet Marketing and creator of the world’s first “Spam Email Message.” How do you like that? How cool is that? And we’ll be speaking about email marketing, social media and, of course, we’ll be talking about Spam. So Gary, it’s awesome to have you here today. Let’s get started. Can you tell our listeners a little bit about who you are and your background and your claim to fame? GT: Well I’m best known for sending the first email Spam back in May of 1978. GT: However my background goes into when I was in the Navy and I was an officer with…and I was a programmer and analyst. So I grew up on Control Data’s first computers and got a lot of experience there and that’s pretty much it and I got to play along the way so that I could understand what was going on in the industry. I’ve been in the industry and around it’s periphery every since. LS: So that cool. So you said in 1978 you were…you had this idea…I read…about telling people about your new computers. There was a new computer out and it was for sale and it was a good price, more powerful. And you had a list of about 398 clients. Well I’m going to let you tell the story….so what did you do? GT: Well, my goal was to introduce the new DECSYSTEM-2020 that supported packet switching, i.e. the ARPAnet, which was the Internet, and I wanted to reach the people on the West coast who were on the ARPAnet and they were hard to reach. I had a few contacts but you could not get them on the phone because the phone was in an office someplace…they weren’t there. You could not reach them in the computer lab where they were most of the time. So we were talking about that and came up with the idea of, “Hey, we’ll send them emails.” So we actually took a…. ahh… there was an email directory… y ou want to call it a phonebook if you want, okay. It had phone numbers in it. It was about this thick and there were about 2,600 people with email addresses then and I took that and I took a yellow marker and I went through and I picked up a whole bunch from…. you know…, “Let’s do Rand Corporation, let do UCLA, let’s do USC, let’s do all these different places. And we invited them to come to two demos that we were setting up for the DECSYSTEM-2020 so they could see that it was working. So we took a DECSYSTEM-2020 which is a very small system, about the size of a small, short two-draw file cabinet…. GT: That’s right! Small then, not by today’s standards…that’s right. And we took it out and set it up and we did one demo in Southern California and then we did the other one out there in Redwood in Silicon Valley. It went very well and it was well received. At each place we had the ARPAnet users who got on line and what we did is we had a dial-up phone from the system back to the system in Marlboro, Massachusetts outside of Boston…and from there they went to the ARPAnet and into their own system back in California. And they were able to try the different functions and things they needed to see that it was all there. LS: Well, so that was pretty interactive, especially for 1978! GT: Oh yeah! These people lived in an interactive world. We had terminals. We did not have PC’s. There was still an interactive environment. LS: Okay! So that by sending that message out to that list of yellow-highlighted clients… what actually did you do? You changed history by sending that first message!! GT: That’s right! I was the first person that did that. And it was only a couple of days later before they all started complaining. LS: (Laughter!) And they haven’t stopped since! LS: So actually what had happened was that just by sending that message, because it was a commercial message, you’re the Father of…. you invented Email Marketing! GT: That’s true. Yeah! The first marketing over the internet/ARPAnet with packet-switching capabilities. LS: Okay, so as a result of that I also have to use this four-letter word that we’re all talking about even today which is called SPAM! GT: Yes. And you know that comes from the Monty Python Show. LS: Oh! Is that where it came from? LS: Yes! (Laughter) And so those in the audience for listeners who do not really understand what SPAM is… I mean you get SPAM… but the actual definition of SPAM according to the 2004 Can-Spam Act is called “unsoliicited commercial email message.” It’s an unsolicated commercial email message. So what happened in 1978 is that you sent out 400 unsolicated commercial email messages. GT: Correct. Yeah, and people do not want to get confused with this. That’s excellent!!!! Yeah, the Hormel family will never live that down. GT: And they carried copyrights for capital letters! So you’re not allowed to use email SPAM in any form in capital letters! LS: (Laughter) that’s great! I’m glad you got a can of Spam there. I saw one of your photographs where you are holding up an “I love Spam” bumper sticker. I think that’s great too! GT: That was…I got that from one of the guys I worked with, Chris. 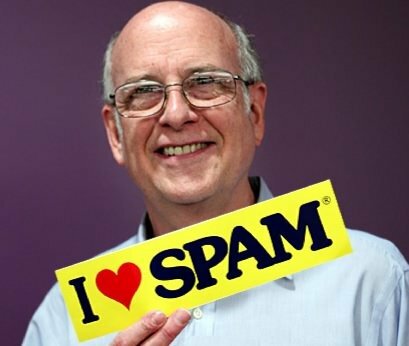 GT: He was a great SPAM guy and he had more than one or he wouldn’t have given it to me. LS: (Laughter) that’s really great! Let me… I just want to take a second to also read some statistics about Spam that I found. • Last year 2 billion Spam emails were sent every day…if you can imagine that number. • Ninety percent of Spam was English and about a year ago 96 percent of Spam started becoming more international. • Eighty-eight percent of all Spam is sent from what is called “Botnets”… and those are basically infected P.C.’s. That’s that malware that we get all the time. • Eighty percent of all emails are directed to North America and Europe…and they are only sent by about 100 Spam gangs… which I was kind of surprised about. Pretty much the Ukraine, Russia, Estonia, Hong Kong, India, the United States. • I thought that was amazing and it says one out of every 12,500,000 SPAM emails actually converts to a sale. But, when you think about the number of Spam messages that are sent out on a daily basis, 200 billion, you are still talking about a really high percent and an opportunity to make a lot of money. So the average conversion in sending out a Spam message is 2.9 percent. And believe it or not, 2/3 of all SPAM is related to pharmaceuticals… which I was kind of surprised to see. LS: So since 1978, Gary, you’ve come really a long way! GT: Yes. That’s true and it took a long time after I did it before it really started…picked up. Okay. You have to pull in the use of the P.C., the availability of the internet, the World-Wide Web is part of it, and that all came together…and that’s when the volume of Spam really started going up. But, the one reason underlying it, I believe, is that why people do it and they continue to do it is that it doesn’t cost them any money. It costs them time and resources, but not money. And that’s why they do it. And I mean it has spread to all these different elements now. I mean it has become the cell phones and smart phones and all of that. And it’s going to spread to those areas because they can reach more people. I actually met one of the Spam kings…. the King of Spam… when they were making the movie, “Spam -The Documentary.” And I was in…I did a little bit in the middle of that and I spent a day with those guys explaining technology to them. And that evening we met one of the guys and he doesn’t show up because his lawyer wouldn’t let him show up in it. But he’s got a regular business on it and he knows where the money is and he makes money out of it… and every once in a while I hear about him in one of the technical newspapers (and that is) he went back to his old ways of blasting away and, you know, because someone came after him again… so. He’s got a full-time wire on his staff. LS: (Laughter) well he can afford it because they are actually making money at it… Spamming us all the time. LS: One of the things with the 2004 Can-Spam Act…everybody asked if the government passed the law stopping Spam, why the heck do we still get so many of them. And of course you know the answer is is that January 1st in 2004 everybody moved their servers off shore and we cannot touch them. GT: Yeah. And they keep moving them around. The thing that really helped those people was when they started using the robots, okay, while infecting other peoples P.C.’s because when they were sending them from their old servers they could be spotted and shut down quickly. So that’s why they developed these other tactics. And they just keep ahead of the general technology of the people trying to stop them. LS: Yeah. It’s a cat-and-mouse game… just keeping one step ahead. And you made a really good point a minute ago when you said they we’ve seen SPAM move. I mean, we’ve seen it move to the fax machines which…because it was inexpensive with mass dialers or automatic dialers… but, we did get a lot of protectors from that. And of course, email…we’re still fighting that every single day at every level possible. But we’re also starting to see that in LinkedIn, Facebook, Twitter… all of the different social networks. And as you said earlier, on mobile phones…it’s getting to be a problem. So do you think that trend is going to continue to grow? GT: Oh absolutely. That’s why we have i- Spam and t- Spam and g- Spam…. Twitter Spam! It’s going to be in all of those areas, okay. The works! The Spam part is not as bad as all the different scams and the malware in general. And that’s the worst part, the malware. And people really… the average person does not make a differentiation. They just call it all Spam. In the industry we make differentiations all the time. But… so we know when we’re dealing with. LS: Well I do email marketing and I think it’s the most effective. As you and I discussed I always agree that email is the original social media and I love email marketing. That is because it gives us an opportunity to have two-way communication with people you have a relationship with. And what’s really weird is is that every time I send out a message I’ll get a small percent of people that actually report me as Spam even though they’ve signed on for my email list. GT: They didn’t like your message! (Laughter). LS: And then I thought it was interesting in one of our initial conversations when you introduce yourself first as the “Father of Email Marketing” and eventually the conversation leads to SPAM…that people actually are offended because they believe that you were responsible for it. I find that amazing! GT: Yeah…they act like I sent them all their SPAM! GT: I hear a little bit of that all the time. Someone want to “should we beat him up” or something. And you hear that! GT: You’ve got to be kidding me! LS: That’s just absolutely crazy. After all these years especially. Now I also read something that…the day that you had sent your email message…or your unsolicited commercial message… the University that you taught at is less than happy about the whole thing. GT: Oh, that’s right! You know I talked to that guy. And he was very unhappy. Well the details on that was we sent three there. I don’t know remember how many names there were, but I picked three names off the directory and they had an old Dec System KA-10… And they only had of disc drives on it… probably had full memory… but I mean 200 gigabytes each, or megabytes each, is all he had on those drives. And, what happened is if you’ve seen my Spam, you realized that only half of the “to” list made it in to… and the rest went into the “body”. So over… the email came overnight, it went in the disc, he got three copies of it and it used up all his extra space. GT: So when he went to use the system he would not let him. GT: So he had to go in and find out what it was and while he had those three active addresses the two people were already gone. GT: And if he had shut those does he would not have gotten three copies… so. GT: That’s what the people in the other community were upset about. It was not that they were getting this information from but that it was… we didn’t make a distribution list up. And we were sending it with everybody’s name and address on there. GT: If you look on that list you will find some very interesting names and locations in there. LS: Well, tell me what you can about that. GT: Well you’ll go through and you will see USC, you’ll see ISI, SOI, Stamford Research Institute, Stamford University… those are the type of names… UCLA. GT: Ahh… research labs and think tanks…Rand was on there…the think tank. GT: …and I shouldn’t be doing this because I was jeopardizing all their positions. GT: …and that was over the technology group at MIT… and said it was good to get something useful. LS: That’s great! So even back then in 1978 you had emails forwarding? GT: Just like now you could use…. GT: …because back then you could not say, “Oh, I’ll attach this to my email and send it to you.” It did not work. There was no such thing. Email protocol was basically text. There were no attachments or graphics or anything else. LS: So how did you transfer files? Was that like a separate routine? GT: You would add… yes… yep. You would go through an extra routine. You had to have the name of the file and “access permitted” and you would go from your server to their server and read it and copy it over the internet. It would be sent in multiple packets. LS: According to today’s standards this sounds really complicated, but back then it was like magic. GT: That’s right. Back then it was considered magic because everybody else was taking a copy of a floppy disc and turning the floppy… sneakernet… as they called it. LS: (Laughter). Sneakernet…I never heard that one before! GT: Yeah. Floppy disc… the floppy disc. LS: Tell me a little bit…the listeners and me…a little bit about your association with ARPAnet and what the heck ARPAnet is. I mean, wasn’t that the foundation, the granddaddy from which everything were doing digitally now? GT: Yes, it’s pretty much what we accept. The ARPAnet was the first working functional packet-switching network. And that’s what we use today. And think of it as an envelope, okay. A packet just like an envelope with a “To” on it and a “From” on it and a message inside, or a file inside. And if we had something large you would have multiples of these. One of five, two of five, three of five, four of five, five of five, okay…that would go down. And even if they followed different paths across the country from one end to the other they were reassembled in the server and presented to you all back together. So that was a really big move. LS: And that’s kind of the beauty of it, to be able to send this through this net to all different types of switches all over the country and have it break up but eventually at its destination be reassembled to a comprehensive message. LS: (Laughter). So originally this was pretty much a spinoff of the Cold War, would you say? GT: Well yes. I think it was Rand Corporation, or someone there who put it into a paper that said, “We should build a network that functions like this and these should be built this way; so that if one link is broken you can just…. it’ll find it way around.” And guys with backhoes are still trying out pipes. I just heard this week that a ship carrying a cable up from the bottom of the ocean, okay. And the thing about this is that they were already routing from three other broken cables all the traffic through that one. So that really isolated an area from one of its major connections. LS: So ARPAnet really was not as afraid about backhoes and ships connecting with cables? Their fear was actually sustaining a nuclear attack. GT: Oh yeah. And even today it’s like that but it’s got a lot of tentacles out there and there’s no back up, okay. It’s big enough and in everywhere enough now that it’ll survive. As you get off of it we have no way if knowing now, okay. It’s a bunch of spider webs now and if you’re here at the one end of those that’s why you can lose your servers. LS: And a lot of people, including Vint Serf, are now a really strong proponent of actually kind of rebuilding this 50-year-old technology from the ground up because they’re getting to the point where we’re kind of maximizing out on the ability to send packets, right? GT: Ahh, yeah…but it’s kind of like, “If you built it they will come.” You know you’re putting in an expressway in town and all of a sudden it’s full right after it opens. So the demand is there and it’s not only the number of people but the things we are using. So instead of there being just some emails and some files going, now we have video streaming. That really eats up a lot of bandwidth. LS: Yeah, video is just huge. GT: Yeah. I remember when they were first doing rapids sending over the internet. This was back at the Air Force… one of the Air Force labs, and they had a protocol for it. We had developed a protocol for every single one of these separate functions. So, to give you a simple example of it… you could have the guys running a simulation in the wind tunnels down at Tennessee in the Air Force Lab and the guys at their lab in Wright-Patterson Air Force Base could watch it. GT: And it was maybe thirty seconds later. But that was like real-time to them. GT: Nobody could do that and they could see it and they could interact. They were talking on the phone at the time but still…. So someday people will sit right in front of their terminals and they will see and talk to somebody on the other end of the terminal… at someplace else. LS: Yes, kind of like what we’re doing now! (Laughter). It’s hard to believe! Geez! Well I remember the old faxes; just getting a page or two pages of faxes and sit and watch that cylinder spin sometimes 10-15 minutes. GT: Oh yeah. You know the way they started faxing the phones. That was a great SPAM scam thing too. So that just tells you they’re going to go out and do that to the phones. The market’s too big. Now that you’ve got programmable phones. I like to call it programmable phones. I don’t like to call the smart phones. I mean the smart phones are just a dumb as your P.C. LS: (Laughter). There as dumb as the user! GT: See, they’re all in it together. (Laughter). Well one of the questions that I have is…here is ARPAnet and DARPA and we’re talking about Cold War technology…cutting edge. How are you in the middle of all of this? How did you get the opportunity to play in that field? So we had about probably somewhere between 20, 25, 30 systems in that research community. They had all kinds of computers. It wasn’t limited to the DEC System which I’m talking about which were the old K-8’s, 36 bits time-sharing systems. LS: It’s 36 bits? A big deal for the time period. GT: Oh absolutely! Yes. Cray’s of course had 48 bits on his, but 36 bit was a big deal. LS: I think it was only the IRS and the Department of Defense that could afford the original Crays. GT: Ah, actually the first one was for the…oh no, not the Crays. I was thinking about the first computer that was bought by the Census Bureau. LS: Probably the Eniac yeah. GT: That was the first big Univac Eniac. Because if you think about it what these guys had to do was they had to write their own software to talk over the ARPAnet and they had to build a board for inside and they had to connect it to these imps that were made by BB&N. So I mean it was all custom made. It’s like if you bought a P.C. now and had to go build a board and build some wires and write the code that on the internet. I mean, how do you think we’d do that? So I put together a summary and the vice-president bought off on it and we were on our way and nine months later we had our product to announce to these people…which was what we were doing. LS: Wow! Did you get a security clearance? LS: Wow! So that was pretty heavy to have that and then go into the private sector and carry that security clearance. GT: Yes. I ended up going back and forth. So I was bringing that security clearance within the different markets. LS: Okay. Okay. So during all this time you’re meeting all these people and watching all this technology. What happened after that? What did you do in your career after that fateful day? How did that develop? LS: So you went to work for AT&T? GT: No, I went to work for our TelCo group and pretty soon I was roaming around Bell Labs. LS: Okay, that’s up in Jersey? GT: Yes. I went several of the Bell Labs. I went to the big beautiful headquarters they had in Baskin Ridge. Boy is that something else! That place was really nuts. LS: That’s where they do a lot of telecommunication… microwave studies and towers and satellites. And they actually discovered the Big Bang Theory there. GT: Oh, I didn’t realize that. GT: I’ve seen a picture of that! Yeah, yeah, yeah! GT: It’s hard to believe they had to build that thing to start with. LS: Yeah, it was amazing. It was gigantic. And they kept getting this background white noise and they thought it was the amplifiers and then they thought it was pigeon droppings (laughter) inside the horn. They kept filtering it but then it turned out that it was the white noise actually created when the universe exploded 14 billion years ago. GT: It’s just amazing! Yeah, how people when they’re doing this R and D, how they stumble a lot of stuff. So I ended up working on what’s is called ACS, Advanced Computer Switch, and what they put together a solution form based on the new Vaxes with EMS cluster and they wanted five systems in there and from there it just, you know, I mean, we locked it up. I cannot tell you how many truckloads and truckloads they bought of our equipment to do that. LS: (Laughter). A good deal! GT: Oh yeah! That was very good. LS: They were customers in the right product at the right time. You were cutting edge. LS: So you were making their lives easier every day. GT: I enjoyed it. I worked…I spent a lot of time in the markets in what you call the early adapters and research and development communities. And that’s always exciting. It’s a lot of fun working in those environments. GT: They were a customer there and they wanted a bigger, better system. GT: Yeah, so you know I just worked with the sales guys and I was out and I got to see a lot of different things and go a lot of places. LS: That’s exciting! So you continue to work for DEC up until when? GT: 1993. So seventeen years. GT: And that was the year they got rid of my whole division. That was when they were shrinking. They were always started the year before and 90 percent of our group was gone in 11 months. GT: Yeah, so…. that’s what was going on in the industry, you know. And within that industry we were busy putting old processes out of business with the new stuff, and we did it to ourselves. LS: That’s true. What did you do in 1993 then? GT: I started working as an independent. GT: And at the point I was an independent marketing rep and I was a consultant. As part of that I go to work for mostly smaller companies, for six months, nine months, a year and a half. You know, those types of things to get them going on projects or inter-project oriented thing, or getting a new system going, or something. LS: Oh okay. What are you doing now? GT: Now I am a consultant, Gary Thuerk the consultant or The Father of Spam event speaker… that type of activity. Ls: Awesome. Do you have a website? Can you tell our listeners if they would like to contact you for consulting or speaking? GT: I don’t have a website but I’m on LinkedIn and they can get to me that way. GT: Yeah. I passed on the website. I figured just to connect and try not to get hate mail. LS: Yeah… (Laughter) that’s right! Can you spell your name so that they know how to find you? GT: Oh okay! Well it’s T as in Thomas, H U E R K. It’s Gary like Indiana. I would still prefer to name that city in Indiana after me. LS: (Laughter) that’s quite an honor! Okay well besides the city is there anything else you would like to share with us here while we’re sharing stories? (Laughter) Any other experiences? GT: I’m available to have a good time and come out to their sales meetings and conferences and their technology meetings…and that kind of stuff. I enjoy doing that. A lot of people enjoy meeting me and we can talk about the new stuff and there’s people who want to talk about the old stuff! LS: (Laughter) Well I sure enjoyed meeting you and I really enjoyed this interview. I appreciate you taking the time to share all this wisdom with our audience. Thank you. GT: Thanks a lot Lon, and it’s quite the thing all those books you’re putting out about social media. So please pay attention to that and get on board. LS: Well I appreciate it and you are part of the foundation of that entire industry and it’s been a real honor to be able to talk to you here today. GT: Thank you very much. I would really like to thank Gary Thurek, the Father of Internet Marketing, and the creator of the world’s first SPAM email message for being here today telling me about eMarketing and the history of email. I think that’s absolutely awesome! This is Lon Safko, the author of The Social Media Bible. Be sure to check out the valuable social media tactics, tools, and strategies that can be found on The Social Media Bible websites at www.TheSocialMediaBible.com. And for more information about me, Lon Safko please go over to www.LonSafko.com. And again, thank you Gary for being here today. See The Actual Email: Click Here!